Time just seems to fly by... I'm taking pics and have lots of good intentions to post but the day is gone and I'm exhausted! The pups are growing so fast now. They are eating well and really starting to play with each other. The barking!!! They are fun and outgoing and know "Cookies" means mealtime. Such personalities in this group! I did decide on a theme, Marvel characters, they all have names but will wait for intros when I can get some help getting individual pics. So here is a massive amount of pics from the last week. Well the munchkins have grown so much! No eyes yet, they are getting more vocal and mouthing on each other now though. Bertie is still the biggest but there aren't any slackers in the weight department. Very pretty puppies, hopefully they will continue to grow well:-) Rosy continues to be a wonderful mom and loves her babies. Single pics are taken just need to edit and post should get to that Tuesday. Trial news- This weekend Patsy and her brother Wick ran in Advanced A course for the first time and did a fabulous job! Sat Wick was 2nd and Patsy 4th, Sun Patsy was 2nd (and RHIT) Wick was 4th. Great weekend for both dogs, will post videos when they are up. The puppies are growing so fast, I guess I forgot how quickly they grow up:-) They are still a bunch of cry babies... wish I was getting more sleep. Alert by Sally-Breckyn brings up the rear. I will try to get boy/girl pics tomorrow, have to do dewclaws today. Everyone is growing, fat and sassy. Thankfully they are letting me get some more rest now! Rosy is an excellent mother and very good with the babies. Love to see the shiny coats and full belly's! Trying to think of a fun litter theme, might have to do something related to the Tough Mudder since they were born on the same day! Really one of those hard days you can't appreciate until you've had some sleep! Rosy woke me up at 1:30am uncomfy but it just felt off. I made the decision to take her to the ER, difficult family issues last week put the related vet off limits:-( So off we went at 2am... an exam later and they said well you can take her home and wait. Um...NO this girl needs a section NOW, thankfully they listened I'm sure the slow night and high cost of my bill had some say in the matter! So we thankfully left the clinic at 7am with 8 beautiful healthy babies and a very tired Rosy. Here comes the WTH were you thinking Amy??? :-) So I signed up to do the Tough Mudder race back in April this year and yup, you guessed it Sunday was the day. So do I let brother and sister down and bail? Of course not, though it was a very real option at 5am! To say I was exhausted is an understatement. I ran home dropped mom and babies to stay with my mom and was back out the door. We barely made it on time and got to the start line just in time. 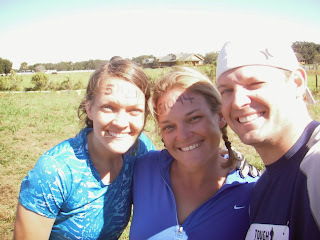 We finished 12 miles and the many obstacles, I think there were somewhere around 25 in 3hr and 15 min! Better than I was hoping for:-) So glad I did it and faced some of the fear, I'm still not a fan of electricity! Wish you could have seen us about 10 mins into the race after walking 1/2 mile in cow crap mud soup! YUCKY. So pics of pups coming soon, tomorrow I promise! They are beautiful and Rosy has become a wonderful mommy.